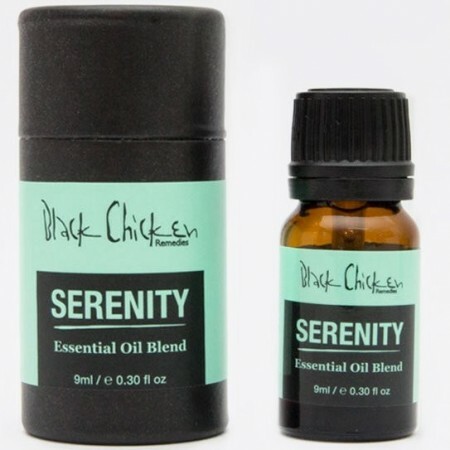 This Essential Oil Blend will bring Serenity back into your life - helping with exhaustion, frustration and in calming the mind. Black Chicken Remedies aromatherapy oil aims to help the wellbeing and health of your body and mind. 9ml. Citrus Paradisi (Pink Grapefruit essential oil), Ocimum Basilicum (Basil essential oil), Citrus Aurantium Amara (Neroli essential oil), Pogostemon Cablin (Patchouli essential oil), Lavandula Angustifolia (Lavender essential oil) Michelia Champaca (Nag Champa essential oil) Origanum Majorana (Marjoram essential oil) Citrus Reticulata (Mandarin essential Oil) Citrus Bergamia (Bergamot essential oil).